Island Peak – The Summit Attempt! Having now “rested” for a day in Dingboche, it was time to tackle Island Peak for the second time. Not before we went back to the French bakery for coffee and cake! Unfortunately the internet was still not working and again, no access to blog updates and work and family back home! We left Dingboche and headed off up the valley to Chukkung. Here, we clocked in for the night and had the best roast chicken, chips and veg I have had in a long time! At the tea house, we met a chap from New Zealand who had summited a day earlier and the view from the top was mist and cloud! Not a peak in sight! Summiting in cloud was not what we wanted and our call to abandon the climb a few days earlier, was the right one. That night, and the night before departure to Island Peak, a gale came through. Sean and I both woke up to the roof of the tea house trying to take off! I was convinced it was a gonner as the wind tore through the village! Sean said “our tents are gone!” How any tent could survive that wind, time would tell. The faces of “Frosty Friday” before tackling Island!! Next morning, with the wind gone and the weather now clearing, we prepared for departure to Island Peak. After a hearty breakfast consisting of an omlette, French toast and coffee, we then headed up towards Island Peak base camp. This was a 3 hour trek, or so. This time there was no stopping at base camp and we went right on by and began the climb up to High Camp at 5600m. 5 hours out of Chukkung we arrived at high camp and immediately got in to our tents, relieved to find them still there! The wind had spared us our tents! That evening, Sean got the whole team together in out tent and we went through the drill for the next morning. We also went through the gear, checking and double checking all ropes, jumars, harnesses, etc. Failure of any equipment at altitude was not an option. With everything in order, we crept in to our sleeping bags. Temps were now down to -10 to -15 degrees! At 2am, I heard Molly calling my name. Time to get up and get going! Now a normal morning at home in my queen size bed, is a mission to get up. Try going it at – plenty degrees, in a tent, ice everywhere….. Not easy! Corn flakes with hot milk and a cuppa coffee was motivation to get us going. Geared up, we were ready to go. At about 3am, we departed high camp, headlights on and a 4 hour climb to crampon point. It was tough going under foot, through snow, ice and rock and it was all straight up! I got in to the “Wisedale Shuffle” and concentrated on my breathing the whole time. We arrived at crampon point just a day was breaking. Here we strapped our crampons to our boots, took out our ice axes, and put on our harnesses. We then got roped together, a distance between us of about 6 meters. We were roped up as follows: Nico, Ongchu Sherpa, and I together, and Sean, Minky and Molly together. It was now into the snow fields and crevasses. 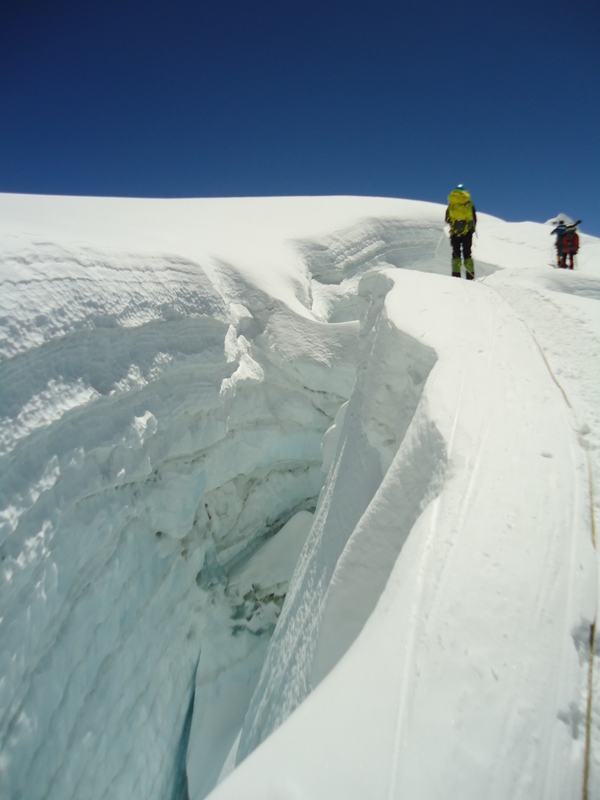 The next 2 to 3 hours was spend crossing ladders, avoiding huge crevasses, and following a snow path to the base of the summit. It was slow going, as we had to jumar our way up sections too steep and dangerous to climb unsupported. On top of Island Peak – Me on the right! We spend 20 minutes on the summit as Sean took pictures and we celebrated all 5 of us on the summit of Island Peak. 6200m and the highest I had been to. Although tired, I had no headache or any sign of altitude issues. I was stoked! Stoked enough to want to climb higher peaks? Not so sure about that! The descent was slow and careful. Reaching the top is only half way and the descent can be very tricky. We had to abseil down the face, again changing ropes as we descended. Across the snow fields and then down the rocky slopes to High Camp. We got in at about 12pm, 9 hours of climbing. However it was not over. After a short break, it was a further 4 hours down to Chukkung. I was tired after a 13 hour trek at 5000m to 6200m! Into Chukkung Resort and chicken and chips, and a cold beer to celebrate our success on Island Peak. Let’s not forget the real reason for climbing Island Peak. This was all part of the acclimatization process for the 4 climbers. They were now acclimatized for 6200m. Next was on to Everest and through the ice fall to Camp 2 at 6600m. Molly’s moms fruit cake and dry wors! Celebratory beer after Island Peak! After an early breakfast, of the same, we started the long walk all the way back to Everest base camp. From Chukkung, it was an hour ½ down to Dingboche. Then on to Deboche, a further 3 hours. On to Gorak Chep, a 3 ½ hour hike and finally to base camp, 2 ½ hours later! A round trip of about 30km and 10 hours later we were back “home! !” Interesting to compare the first time we trekked in to base camp, and this time, over the same distance. It took us 2 days from Dingboche to base camp the first time. This time we did the same distance, plus an additional 7 km, all in one day! Our acclimatization program was working, and we are getting fitter! News from Base Camp? So, what was happening at Everest whilst we were away? Firstly, the ice fall had been closed for 3 days after a few minor collapses of small seracs. Not safe, the ice doctors suspended work. Our team of Sherpa’s was fortunate enough to get through before the closure and had stashed supplier at camp 2. This included food, a tent for cooking and oxygen bottles. They were then off Everest before it was closed. Further to this there were a lot more expeditions now at base camp and it was filling up. With the whole team now back at the “comfort” of our base camp, we settled in to a few days rest before the team entered the ice fall for their first tour. Back at Base Camp and a bit of washing! Darling Rob. we actually have a King size bed but understand that Mocha Cat takes up a large percentage of it! Its even bigger now that you have been gone for a month. Has Molly taken up my role and bringing you a hot cuppa coffee in the morning? Island peak climbing for fine and genuine information if you are looking for peak climbing in nepal.